In the beginning I set out to build my best approximation of a Roman scutum. It was going to be exciting to learn something about the evolution of Roman tactical equipment while also getting to use power tools. I soon found that making an exact look-alike would be difficult. An original shield would have been made of plywood and would have been bent by hand. Due to time and resource constraints, I decided to craft my shield from polystyrene foam. 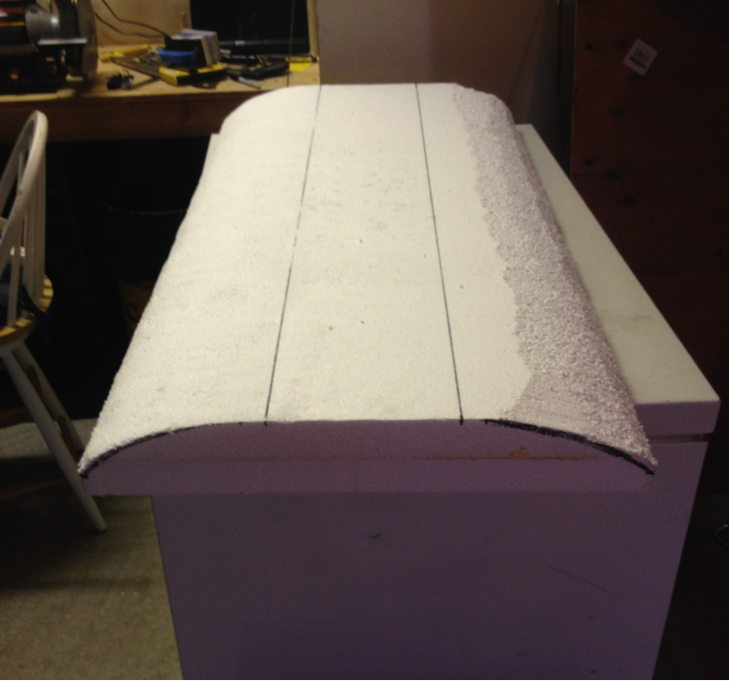 This is the kind of hard foam that is used for insulation. Once I had purchased a block that was four feet long, two feet wide, and 2 inches thick, I proceeded to carve it. At the start, I tried using an orbital sander. The filter of this tool quickly clogged with foam particles. Because of this, I was forced to carve the convex part of the shield the old-fashioned way, by using elbow grease. It felt like Christmas while I sculpted the front of the shield with a sanding block. Small pieces of foam clung to me and everything else they came in contact with. I modeled the convexity of the front by looking at pictures of replicas and a recovered shield on the Internet. Due to the thickness of the foam, the scutum I made only had about 1/8 the convexity of the real shield that Roman heavy infantrymen carried. After about four hours of sanding, I had the shape that I desired. It was then time for the back. My longing to use power tools was finally satiated when I sculpted the handle in the back of the shield. The handle was traditionally made of wood and located in the center of the shield. Because my scutum was so thick, I only carved the handle half of the way through the foam. To accomplish this, I used a dremel tool. This made the job much more quick than when I sculpted the front with sanding block. Next, I moved to the central boss. My boss would not be as deadly as the metal one on the real scutum. This was because it was made of hollow foam, from the floral department of the local craft store. The installation of the eight-inch half sphere was incredibly easy. 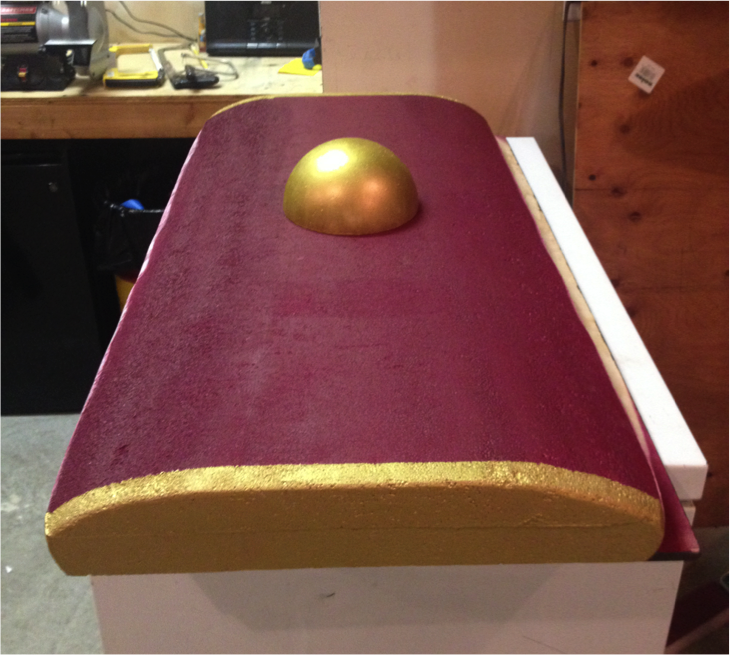 Once it was installed it only took a few coats of paint to make the shield look like a brand new scutum, ready for action. Some recovered scuta had ornate paint jobs, but due to my lack of artistic ability, I went with garnet for the body and bronze for the boss and “metal” strips around the edge of the shield. Through the process of making my shield I had the opportunity to learn about the evolution of Roman military tactics. The fabrication also gave me a chance to get back to my inner craftsman. Although I enjoyed the process, material and time constraints seriously limited the authenticity of my scutum. It seems that in the end, “approximation” was the correct word.